The Snedeker family occupied this portion of the Pond Patent from c. 1730 until 1909 – about 179 years. Part of this stone house was built c. 1747 by Tunis Snedeker’s son Johannes, a captain in the colonial militia. As patriots in the Revolution, he and his son Garret were captured by the British. Johannes died in Sugar House prison in 1779; Garret was exchanged and released. 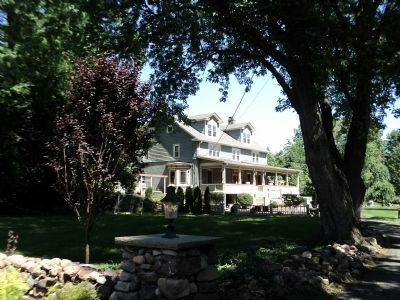 In 1793 he enlarged the homestead. Erected by Historical Society of Rockland County. Marker series. 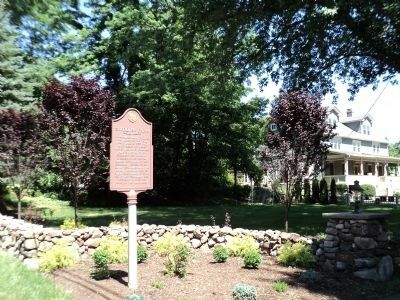 This marker is included in the New York, Historical Society of Rockland County marker series. Location. 41° 9.183′ N, 73° 56.858′ W. Marker is in Congers, New York, in Rockland County. Marker is at the intersection of Endicott Street and Pine Street, on the right when traveling west on Endicott Street. Touch for map. Marker is at or near this postal address: 74 Endicott Street, Congers NY 10920, United States of America. Touch for directions. (approx. ¼ mile away); Congers Station (approx. 0.4 miles away); St. Paul’s Church (approx. 0.7 miles away); Congers Lake Dam (approx. 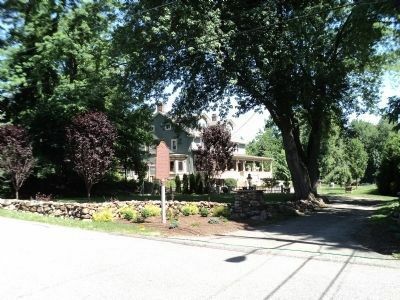 1.2 miles away); Paul Farmhouse (approx. 1.2 miles away); Doctor Davies Farm (approx. 1.3 miles away). Touch for a list and map of all markers in Congers. Related marker. Click here for another marker that is related to this marker. The Sugar House was a notorious prison in New York City. More. 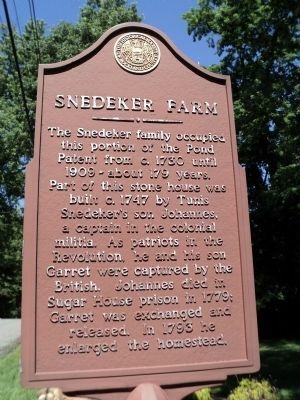 Search the internet for Snedeker Farm. Credits. This page was last revised on March 26, 2019. This page originally submitted on July 5, 2011, by Bill Coughlin of North Arlington, New Jersey. This page has been viewed 1,037 times since then and 30 times this year. Last updated on March 25, 2019, by Larry Gertner of New York, New York. Photos: 1, 2, 3, 4. submitted on July 5, 2011, by Bill Coughlin of North Arlington, New Jersey. • Bill Pfingsten was the editor who published this page.